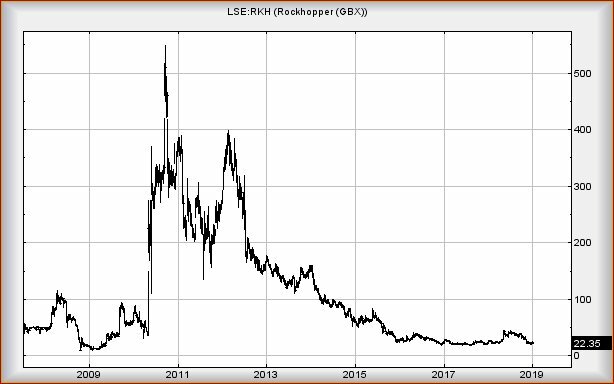 Rockhopper #Gold #SP500 By any standards, #Rockhopper share price appears to be floundering and the historical picture from the chart is vile. The immediate rate of downtrend tends suggest the price requires above 31p before we can risk discussing the big picture bottom potentials. To cut a long story short, it appears weakness now below 20p shall drive the price down to an initial 15p. If broken, a longer term bottom calculates around 0.6p. Essentially, the price is floundering and now resides in an area where bad news could have quite devastating consequences. We’ve shown the chart without our usual crayon marks, just to highlight movement since 2009. Essentially, the price was “talked up”, optimism gradually was eroded, and now it’s in a position where a poorly worded RNS risks making a lot of traders very unhappy and walking like penguins. However, even a nod above 31p will tend provide warning of a coming miracle. In theory, this should trigger moves to an initial 36p with secondary, if bettered, a game changing 47p which will provide strong future prospects. For now though, we suspect it shall bottom at 15p, hopefully then given sufficient reason for a proper bounce.